Having custom made table booth for your kitchen definitely will help you a lot when you are entertaining lots of guest for certain special occasions. It does not only have multi-functional usage, but also can give your kitchen a fun and unique feeling. Custom table booths are capable of providing you with flexible seating and by having one in your kitchen room can help you accommodate your guests with comfortable seating when they are enjoying their meals. In order to build a table booth, you only require basic materials and also a little carpentry skills. 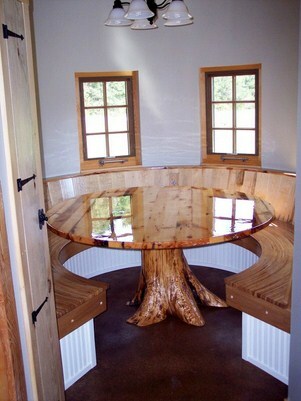 The table booth can also be adjusted as and when you need it for additions or comfort, size as well as overall style. Below are some tips that you can learn in building a custom table booth for your kitchen. First thing that you need to do is to lay out two 24-inch 2-by-4 boards at the surface of your work area. Make sure that the larger surfaces of the boards are on the ground parallel to each other and at least 17 inches apart. Then, you need to place two more of the same boards on top of them, perpendicular in order to create a square frame with 24 inches to the side. Next, take your drill and make two holes in each corner before you attach the boards together simply by drilling 2 1/2-inch wood screws inside each of the hole that you have made. After that, you need to repeat the same process again in order to build another square wood frame. Once you have finished building the two wood frames, you need to stand both of them upright which will be the leg support where you have to space them at least 2 feet apart from each other and make sure they are parallel. Then, you need to lay out six 36-inch 2-by-4s across the two leg supports by evenly spaced front to back and side to side. You must make sure to keep the front and rear of the 2-by-4 even with the outside surfaces of your leg supports. Next, take your drill and make two holes through each long board, or seat board, and also into each of the leg support. After that, you have to attach them all together using 2 1/2-inch wood screws. You need to repeat all previous tasks so that you would be able to create another bench. The next step that you need to do is to position a 3/4-by-36-by-36-inch sheet of plywood vertically behind each of the bench. Ask your friend or assistant to hold them in place in order for you to drill 2 1/2-inch wood screws through the back of the plywood and into the seat boards and also the leg supports. Make sure that the screws you drilled have spaces of at least 12 inches for each screw. Then, you need to set the benches on their sides and faces each other. Next, you have to suspend two 60-inch 2-by-4s against the leg supports of your benches before you slide the benches back to the edge of the long board. After that, you must secure them by screwing your long boards onto the benches. You need to at least drill four screws through the long board and into each of your table booth leg support. Next thing that you need to do is to position two 36-inch 2-by-4 boards with their small ends against a long board directly between the benches with spaces of at least 8 inches apart. Again with your assistant’s help you need to hold the boards parallel to each other by making sure that their edges are even with the edges of the long board but they are still perpendicular. These will be the supports of your table booth. Then, take your drill and make two holes through the long board and into the end of each of your table support. Make sure to secure and attach them with 2 1/2-inch wood screws. You need to repeat the same step for adding two identical boards on the other long board. Finally, you need to set a 3/4-by-24-by-36-inch plywood board evenly on top of your four table supports. Take your drill and make two holes down through the plywood and into each of the table support before you can attach them in place by using 2 1/2-inch wood screws. If you want to create additional comfort when using your custom made table booth, you can simply add fabric-covered foam cushions onto the seat and also its backrests. Always remember that whenever you want to build a custom table booth for your kitchen make sure that you always be extra careful when using power tools. You should also add additional support to your tabletop when the need arise by attaching long, thin boards in between your table supports and the tabletop. If necessary, you could even add a 1-inch L-brackets metal to strengthen it. This entry was posted in Home Improvement on January 25, 2012 by Mike.